Virbac Indorex Defence Household Flea Spray is a household friendly flea spray, that's also effective at killing dust mites and stopping development of eggs and larvae. Virbac’s Indorex keeps your home flea free for a full 12 months. 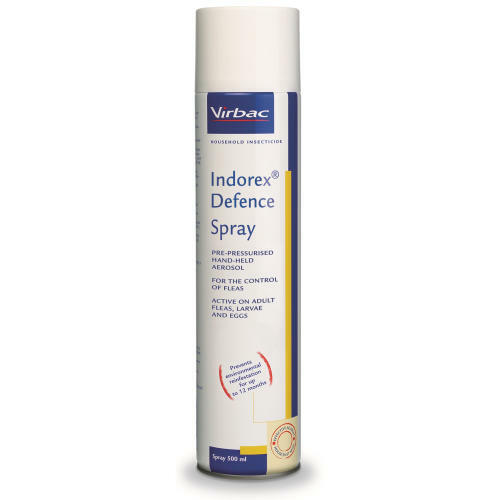 An odourless spray, Indorex is the only household spray proven to be UV stable - working equally well in areas with bright sunlight such as cars and conservatories, and is safe to use in households with very small babies as well as pregnant women. A single can is enough to provide coverage for a three bedroom semi detached house for a whole year. After application, it is recommended that you vacuum regularly as the vibrations will stimulate any pupae to hatch into adult fleas, at which point Indorex's adulticidal properties will take effect. Vacuuming will also help remove any lingering dust mite fragments which otherwise remain potent allergens to some people and pets.